Mark Abney, peanut entomologist at UGA, visited with Georgia Peanut Tour attendees during the three-day tour on the various pest issues and the research he has been working on the last two years. 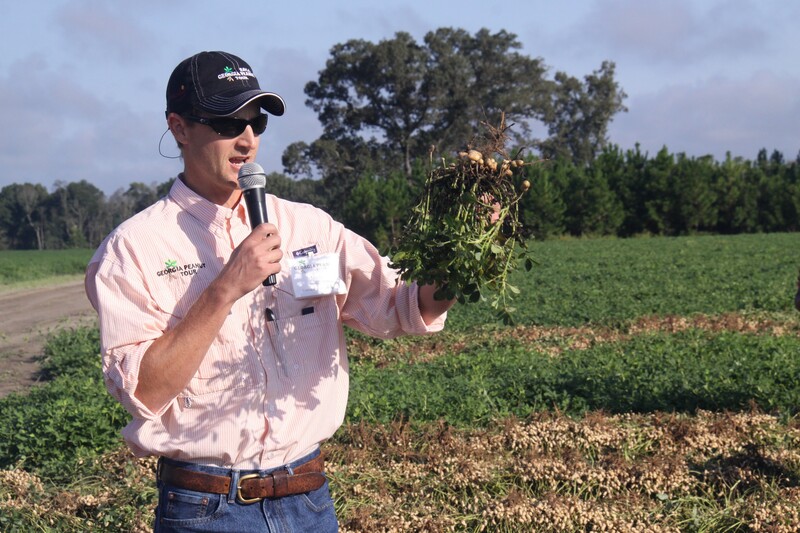 Abney also has an efficacy testing program where he looks at all of the new chemistries and some of the older chemistries on the established pests we have to determine what is the best product to use for the pests we have in peanuts. According to Abney, 2014 has been a very buggy year. He says the year started out early with thrips, very much like in 2013. Then growers went straight from that to some caterpillar problems that have been higher than a normal year. The two things that have been really problematic for growers this year have been lesser cornstalk borer and two spotted spider mite. “Those are probably the two most important pests we have had in Georgia. They are not a pest every year but when they are it can be really problematic,” Abney says. “We have spent a lot of money and heartache trying to control those two pests.” Both pests are very difficult to control especially in non-irrigated fields with the hot and dry conditions we have seen in 2014, he adds. Abney also has a blog where he provides growers the latest information on peanut pest issues at http://blog.extension.uga.edu/peanutent.